A happy blue border surrounds a delicate and whimsical vine of birds and flowers, which in turn, encompasses the wedding vows in comforting simplicity. Gold accents highlight the fanciful flowers, birds & border. 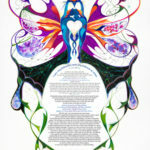 Butterfly glow is interlaced with science and nature. often plants and animals have symmetrical body shapes and patterns. We have so much in common, yet very different.. 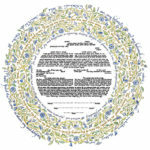 Please note: If you purchase this ketubah with personalization, your information will be filled in via computer-print rather than hand-calligraphy. 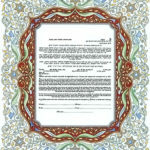 Hand-calligraphy is not available with this ketubah. 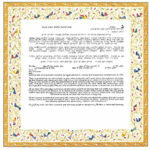 East 2 Ketubah – With the dawn of a new day the sun rises in the East. Such should be a marriage with every day a fresh beginning. The Orchid flower symbolizes beauty, strength, richness. Exotic and graceful, represents love. In ancient Greece Orchid were associated with fertility, and during the Victorian era, Orchid symbolized richness and luxury. The Orchid of Madagascar is mostly unique.. It all began back in 1862, in the south of England, Charles Darwin first examined an unusual flower, an Orchid of Madagascar that seemed to defy the laws of nature. This flower hid its nectar in the bottom of an elongated nectary – up to a foot long – extending from the back of the flower. It seem in-conceivable that any insect could ever reach it. Charles Darwin predicted that somewhere in Madagascar must be a gigantic moth feeds from this flower. Darwin peers ridicule his prediction. 150 years later the unusual moth still exist and was discovered drinking from the Orchid nectary. A heavenly match of nature..
An exotic garden with flowing water, a scene that combines elements of Moorish Celtics & Asian styles. An interlaced love of Celtic weaving designs-the knot of love along with Chinese motifs. Situated at the top on each side of the canopy are Chinese peaches- A symbol of marriage, springtime, immortality, long life. Next to the peaches, in blue tones, on each side, a Chinese 'Water lily', bats and coins-symbol of purity, long life and wealth. The top knot circle, is a sun flower. It reflects over the garden with its strength, energy, and vibrancy to life. Like an organism, the universe is alive, transformed and reborn into new forms. The universe is a fascinating process of creation moving through time, like a melody, like a dance of particles in the heart of expanding suns. Our solar system is like a womb that brings forth life. As the journey of the universe unfolds, we discover its beauty, navigating on Earth through the stars. 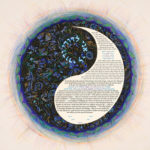 The concept of yin and yang originates in ancient Chinese philosophy and metaphysics, which describes two primal opposing but complementary forces found in all things in the universe. Yin, the darker element, and corresponds to the night; yang, corresponds to the day. Nothing in the universe is completely yin or completely yang everything is a mixture of the two. Yin and yang are interdependent. One cannot exist without the other. For example, day cannot exist without night. 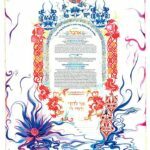 The long awaited replacement for the Song of Songs Ketubah, the new Song of Love has two intertwining vines representing the love and commitment of the couple. Blooming flowers and singing birds airily surround the wedding vows. 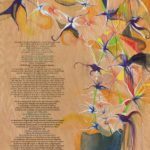 Gracefully calligraphed biblical verses, in muted colors and shining gold, dance around and through the watercolor illumination. 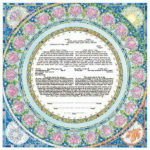 Fine gold foil accents create an elegant finish to the ketubah. 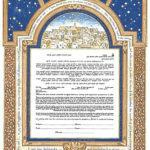 Jerusalem under a starry twilight is rendered outside of a carved and inlaid window creating a striking border for seven expressions of love and hope that are beautifully calligraphed on this ketubah. Gold foil outlines enhance the stunning artwork. 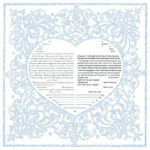 The ketubah text is encircled by a finely detailed mosaic of flowers blooming in the shape of hearts. 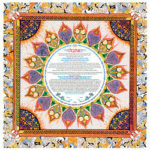 The intricate images of the four seasons represent the cyclical nature and commitment of the marriage vows. Fine gold foil accents shimmer in the light. The Rakefet (Cyclamen) is a herald of spring throughout the center and north of Israel. 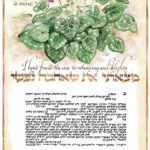 The quotes from Song of Songs are enhanced by the beauty of these flowers, symbols of new beginnings. Fine gold foil accents glimmer like morning dew.